A holiday on Lake Garda allows you to visit so many places. On Lake Garda there are historic village such as mountains, botanical gardens and amusement park. Allow us to make you discover beautiful and unexpected realities. Verona, Gardaland, Venezia, Desenzano, Mantova, Sirmione o Salò and more. Would you like to spend a special holiday? At Hotel Residence Miralago, in Manerba, we always have fun and attractive packages and offers. The Junior Suite rooms are recently been renovated with elegant modern furniture and ceramic floors. All have a bathroom with box shower and offer every comfort for a pleasant stay. The rooms have a living room and a balcony with lake views. A stay like in a 4-star hotel, with a 3-star hotel price. 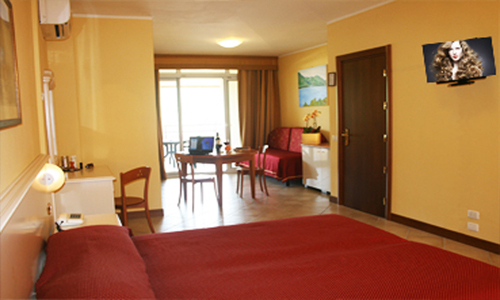 The Superior Rooms are recently been renovated with elegant modern furniture and ceramic floors. All have a bathroom with box shower and offer every comfort for a pleasant stay. the best value for money. View on request (only for direct booking). Room with living area, with table and fridge.. The rooms are double and offer every comfort for a pleasant stay. Furnished with classic furniture, they have bathroom with shower and balcony. The rooms have a partial view of Lake Garda. 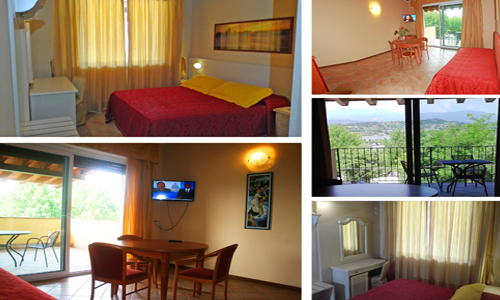 It is possible to choose a Standard Double Room with air conditioning and a small fridge. It is possible a double economy with fan and the cheapest price. 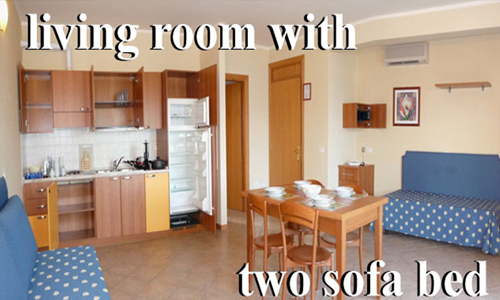 Family holydays for 3 guests , Family Rooms for two adults and one child. It offers a double bed and a single bed, baby bottle warmers, a kettle and a high chair on request. Ideal for a comfortable holiday. The room has a large bathroom with shower. A large covered balcony with table and chairs. You can relax on the edge of our pool or in the garden. Miralago is a hotel with swimming pool on Lake Garda in Manerba, where it is possible: Sunbathing by the pool and in the garden (also with dogs), watching the children in the hotel playgrounds. Miralago is a beautiful hotel in Manerba del Garda on Lake Garda and offers you on the spot a bar, restaurant, extended common terraces, Wi-Fi, swimming pool, solarium on the garden, play garden, table tennis, beautiful private garden, conference room. Special rooms for disabled guests, It is necessary to specify your needs at the booking time. Launch Bar from 10am to 11.30pm soft drinks, coffee, ice cream and sandwiches. All rooms have a large balcony with table and chairs, choose your view, do you prefer the garden, the Green Rocca hill or the lake view. You can sunbathe with your dog in your garden and have breakfast on the veranda. The dog must be indicated at the time of booking. The price varies depending on the size. Only one dog is allowed in the room.